John Kesner uses a positivist approach to carry out research into the reasons behind reporting suspected child maltreatment. He specifically hones in on fabricated reports where no supporting evidence was found, drawing on data from nine US states and Puerto Rico between 2005 and 2015. He considers the ramifications for victims of child maltreatment, including those involved in cases found to be fabricated. Each year, millions of reports of suspected child maltreatment are made to child protective services (CPS) in the U.S. For example, in 2016, CPS agencies across the U.S. received 4.1 million reports involving 7.4 million children. This represented almost a 15% increase since 2012 (U.S. Department of Health & Human Services, 2018).Most of these reports generally come from professionals legally mandated to report, while the rest come from non-professionals who have reason to suspect that a child is being mistreated. The majority of reports made are determined, by CPS to be made in “good faith”.That is, the person making a report genuinely believes the child may be suffering some type(s) of maltreatment (Owhe, 2013). Yet, even those reports made in good faith are often determined to be unfounded. Of the 4.1 million reports made in 2016, slightly more than one-half were investigated and of those, less than three-quarters of a million were substantiated. Thus, in approximately 70% of investigated reports, maltreatment is not found. Other studies have found an even higher rate at 80% of investigated reports unsubstantiated (Child Welfare Information Gateway, 2017). The figures cited above do not suggest a relatively low incidence of child maltreatment in the U.S., but rather they highlight the difficulties of substantiating a report of child abuse and/or neglect. In fact, many researchers claim that child maltreatment is under-reported (Giardino, 2016). In addition to the reports made in good faith each year in the U.S., a small percentage of reports made to CPS agencies are not; the person making the report knows the report is baseless, yet still reports. These reports are sometimes referred to as “false” reports. However, this term is somewhat misleading as it encompasses reports made in good faith, but not substantiated as well as those made when the reporter knows the report is unfounded. Reports that are not made in good faith – that are intentionally false – are better described as fabricated (Meyers, 2014). There are many reasons someone might make a report of child maltreatment that they know is unfounded. Legal experts contend that the majority of fabricated reports child maltreatment occurs within custody disputes in family court (Neoh & Mellor, 2009). Justifications for some fabricated reports rely on the “it’s for the good of the child” logic. One parent believes the child would be at such risk with the other parent that they make-up an allegation of child maltreatment. Often there is little or no forensic evidence to support or refute reports that occur in this context (Bala, Mitnick, Trocme & Houston, 2007), leaving a great deal of confusion for the families, attorneys, and the courts. The courts, so concerned about this, are likely to question the credibility of the parent when an accusation of abuse, especially sexual abuse is made in a contentious child custody suit (Meyers, 2014). It is possible to have several different legal actions occurring in different courts in response to a report that later turns out to be fabricated, creating more confusion for the parties involved, especially the child. This is not to suggest that all maltreatment reports made during child custody or divorce proceedings are necessarily false. Often physical or psychological intimidation by one partner when together may prevent the other from making a maltreatment report, and it is only after separation that they feel safe in doing so (Bala, et al., 2007). Fabricated reports of child abuse and neglect can have devastating consequences for the alleged child victim and the alleged perpetrator. The very system designed to protect the best interests of the child can be abused in an attempt to gain an advantage in a contentious divorce or custody case.An allegation of child maltreatment results in the involvement of multiple entities with overlapping jurisdictions and sometimes conflicting priorities, leading to a more difficult and complicated resolution. The potential involvement of the child protection system, the courts, law enforcement, physicians, and mental health professionals greatly increases the risk of adverse effects on the child victim. A fabricated allegation of child maltreatment introduces a multitude of adverse effects on the alleged perpetrator as well. 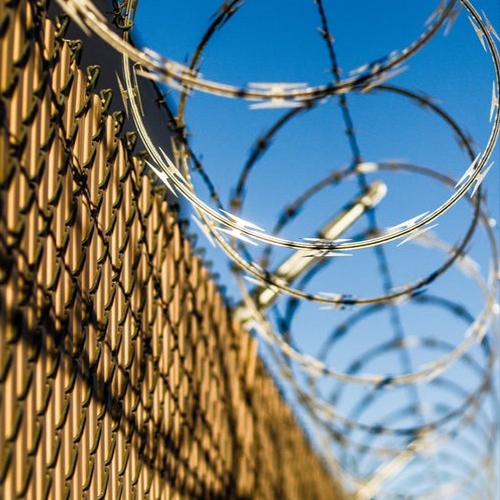 In addition to the potentially devastating personal effects from the potential agencies involved (incarceration, professional and personal reputation damaged, etc. ), the relationship between the falsely accused and the alleged child victim may be irreparably harmed. In some cases, the fabricated reports of child maltreatment may induce a young child to falsely believe the abuse occurred (Bala, et al., 2007). The investigative process can take many months or even years, during which the child has a strained relationship with both parents and is in a sort of legal limbo. Because the overall rate of fabricated reports is low, they have not received much attention in the child maltreatment literature. Yet, the ramifications of a fabricated report for the child and the accused make it critical that more is understood about these reports. Thus, it is possible, through the examination of reports of child maltreatment made over multiple years, to gain a better understanding of the characteristics of fabricated reports. The purpose of this study was to analyse reports of child maltreatment made in the U.S. between the years 2005-2015. Data from the National Child Abuse and Neglect Data System (NCANDS) were utilized. NCANDS was created through an amendment to the Child Abuse Prevention and Treatment Act (CAPTA) in 1988. This amendment established a national data collection and analysis program for child maltreatment reports made across the U.S. There have been several amendments to CAPTA which has greatly enhanced the quality of the data on reports of child maltreatment collected each year (Child Welfare Information Gateway, 2016). Currently, all 50 states, the District of Columbia and Puerto Rico send child maltreatment report data to NCANDS. In the present study, nine states and Puerto Rico were selected for analyses as they were the only ones to submit data on fabricated reports for all years between 2005 and 2015. Despite the limited number of states sampled, they represent a cross-section of geographic areas in the U.S. Data were analyzed to assess any significant differences between fabricated reports and those made in good faith in relation to, (1) the report source, (2) the type of maltreatment reported, (3) gender, (4) age, (5) race of child of the child involved in the report, and whether the child involved in the report was a (6) prior victim of maltreatment. Chi square analyses were conducted to examine differences between reports on all variables except for child age. A t-test was conducted to assess differences between the two groups in relation to the age of the child in the report. Due to the relatively low representation of intentionally false reports in the larger population of child maltreatment reports, disproportionate stratified sampling was utilized. This sampling technique is used to ensure adequate representation of the “rare population” in the statistical analyses (Bornstein, Jager & Putnick, 2013). As the fabricated reports represent a gross misuse of the child abuse reporting system and potentially produce devastating consequences, this sampling method was used to ensure adequate representation of this important sub-set of child maltreatment reports. Thus, a sample of 1,000 fabricated reports and 1,000 good faith reports were selected for analyses. Results of the Chi Square analyses revealed that there were significantly fewer African American children involved in fabricated reports,X2(1, N = 1859)31.3, p < .001 compared to their representation in good faith reports. Conversely, the number of White children involved in fabricated reports was significantly higher than in good faith reports X2(1, N = 1859) 22.1, p < .001.Additionally, there were more Hispanic children involved in fabricated reports of child maltreatment compared to the percentage involved in good faith reports X2(1, N = 1859) 4.1, p < .05. Children involved in fabricated reports of child maltreatment were less likely to have been prior victims of maltreatment. X2(1, N = 1987) 37.06, p <.001. The percentage of reports of physical maltreatment was not significantly different between the fabricated and good faith reports. However, significant differences were found with respect to reported neglect and child sexual abuse (CSA). Fabricated reports contained more reports of neglect compared to reports made in good faith X2(1, N = 1987) 8.7, p < .01. There were nearly twice as many reported cases of CSA compared to reports made in good faith. X2(1, N = 1998) 13.1, p <.001. Despite the relatively low incidence of fabricated reports of child abuse and neglect, in child maltreatment reports, they represent an important area for research. The long lasting and potentially devastating effects on both the alleged child victim and alleged perpetrator warrant an examination of these cases. Based on the results from this limited sample, fabricated reports of child abuse and/or neglect seem to affect mostly White children. Although there were significantly more Hispanic children in the fabricated report group as compared to Hispanic children in the good faith report group, the mean difference was smaller than for White children. Additionally, the inclusion of fewer prior victims of child maltreatment may suggest that fabricated reports are used more often in contentious divorce and custody proceedings and most likely do not reflect an ongoing pattern of child maltreatment. A report of child maltreatment during a divorce or custody case, when there has been no history of such reports, should raise a warning to CPS that the report may indeed be fabricated. Of more significance were the findings about alleged sexual abuse. Generally, reports of child maltreatment made to CPS across the U.S. contain relatively few reports of CSA. This is not to suggest that CSA is a minor problem. It is because of its heinous nature and the social stigmas associated with CSA, that it is most likely under-reported. However, in official CPS data, it is reported less frequently than other types of maltreatment. In 2016 for example, almost 80% or the reported maltreatment cases involved neglect compared to 8% for CSA. Data analysed in this study also found a relatively low percentage of reported CSA. However, the difference in reports of CSA between the good-faith and fabricated report groups is of more concern. 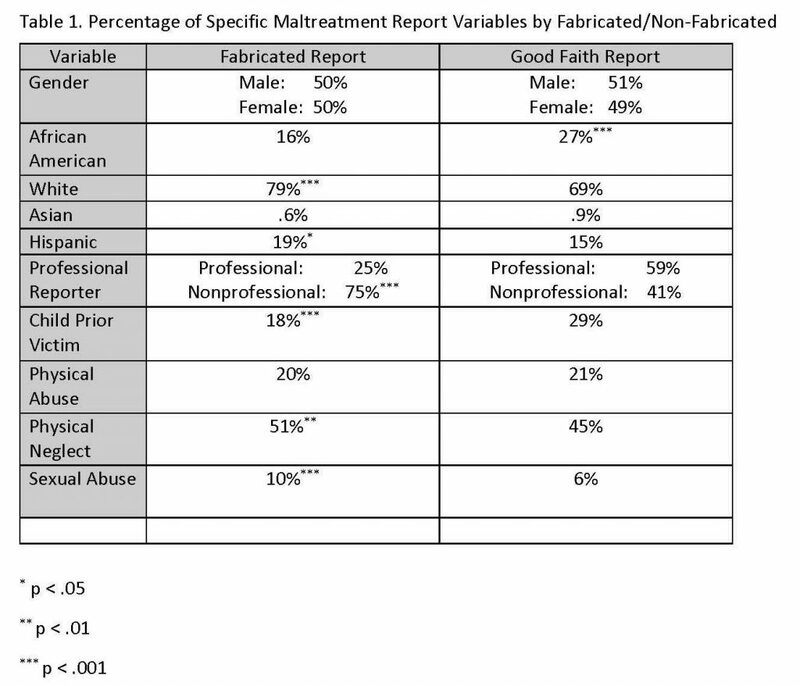 The nearly doubling of CSA reports in the fabricated report group compared to the good-faith group supports the idea that reporting maltreatment, particularly CSA may be used as a technique to gain an advantage in court. These findings are similar to other studies which found that the number of fabricated reports of child maltreatment, and particularly CSA increase in contentious divorces and child custody disputes (Kerns, 2016). The law requires that CPS, law enforcement and other appropriate agencies investigate all claims. These reports are frequently unsubstantiated. Some studies put the percentage of unsubstantiated CSA reports in divorce and child custody cases between 36%-55% (Cecka, 2014). The current laws regarding fabricated reports of child maltreatment are difficult to enforce. When the standard for reporting is “reasonable suspicion”, proving malicious intent on the part of the reporter is very difficult. Non-custodial parents are usually more likely to make fabricated reports (Trocme and Bala, 2005). CPS may be reluctant to report suspected prevaricators for fear that it will scare into silence reporters of real abuse and neglect. The law protects individuals making “good faith” reports of child abuse and neglect; protecting them from civil and criminal prosecution. Naturally, no such protections exist for fabricated reports made with “malicious intent”, however, determining the motivation behind maltreatment reporting is at best, difficult.Although all forms of child maltreatment are unacceptable, child sexual abuse is particularly heinous. To falsely accuse someone of this type of maltreatment to gain a legal advantage or to hurt an estranged spouse is deserving punishment to the fullest extent of the law. The other finding which is a cause for concern relates to the source of fabricated reports of child maltreatment. As expected, the overwhelming majority of these types of reports came from non-professional, non-mandated reporters. However, one-quarter of all fabricated reports came from professionals who through their regular contact with children, are legally mandated to report suspected abuse and neglect. One can only speculate as to the reasons and situations which motivated mandated reporters into making deliberately false allegations. Aside from the adverse effects on the child victim and alleged perpetrator mentioned previously, this is especially troubling, as mandated reporting is a crucial link in the reduction of childhood abuse and neglect. There are two possible explanations for a mandated reporter making a fabricated report of child maltreatment. First, and hopefully more likely, is that it is done to protect the child. Lacking specific and credible evidence that a child is being maltreated, a professional may choose to make a fabricated report to bring a potentially dangerous situation for a child to the attention of relevant authorities. This “for the good of the child” logic stands in stark contrast to the second motivation for making a fabricated report; an attempt to gain a legal advantage. As mentioned previously, fabricated reports made in divorce or custody disputes by one spouse against another are not uncommon. In these data, legal/law enforcement and educational personnel were responsible for the largest number of fabricated reports. It is difficult to imagine a scenario in which school personnel would deliberately make a false report to benefit one spouse over the other in a divorce or custody proceeding. The previously discussed “for the good of the child” logic is more likely the root of a fabricated report made by educational personnel. With legal/law enforcement personnel, it is less clear as these personnel may have more direct contact with the courts and CPS. Unfortunately, the limitations of the NCANDS data-sets do not permit conclusions to be drawn regarding the motivation of those making fabricated reports, but this area should certainly receive further investigation. Finally, it may be inappropriate to use the term “alleged victim” or “alleged perpetrator” in cases where reports are fabricated. Although the child may not be the victim of the maltreatment in a fabricated report, the potentially devastating consequences discussed previously make them a victim none the less. Similarly, the consequences to the perpetrator of child maltreatment are justified when abuse and/or neglect have occurred. If falsely accused, the “perpetrator” also becomes a victim. In addition, the resources used in the investigation of these types of reports could be better spent elsewhere to assist efforts to reduce the incidence of child maltreatment. The findings from this study should not be generalised to the larger population of child maltreatment reports in the U.S. This was a limited sample with reports from only 9 states and Puerto Rico. As mentioned previously, these states were the only ones to include information about fabricated reports during 2005-15. Although they came from geographically varied parts of the U.S., these data can’t be considered a representative sample of fabricated reports of child maltreatment in the U.S. Additionally, the use of stratified sampling with disproportionate allocation is not without its issues. The possibilities of over-representation of certain population strata present potential problems with interpretation of findings. However, it is an acceptable sampling technique when, as in this case, one of the sub-samples of interest has extremely limited representation in the larger population (Barron, Davern, Montgomery, Tao, Wolter, Zeng, Dorell & Black, 2015). The analyses presented in this publication were based on data from the National Child Abuse and Neglect Data System (NCANDS) Child File, FFY 2005-2015. These data were provided by the National Data Archive on Child Abuse and Neglect at Cornell University, and have been used with permission. The data were originally collected under the auspices of the Children’s Bureau. Funding was provided by the Children’s Bureau, Administration on Children, Youth and Families, Administration for Children and Families, U.S. Department of Health and Human Services. The collector of the original data, the funding agency, NDACAN, Cornell University, and the agents or employees of these institutions bear no responsibility for the analyses or interpretations presented here. The information and opinions expressed reflect solely the opinions of the authors. Bala, N., Mitnick, M., Trocme, N., Houston, C. (2007). Sexual abuse allegation and parental separation: Smokescreen or fire? Journal of Family Studies, 13, 26-56. Barron, M., Davern, M., Montgomery, R./ Tao, X., Wolter Kirk, M., Zeng, W., & Black, C., (2015). Using auxiliary sample frame information for optimum sampling of rare populations. Journal of Official Statistics, 31(4), 545-557 doi: 10.1515/jos-2015-0034. Bornstein, M.H., Jager, J, & Putnick, D.L. (2013). Sampling in developmental science: Situations, shortcomings, solutions and standards. Developmental Review, 33(4) 357-370. http://doi.org/10/1016/j/dr.2013.08.003. Child Welfare Information Gateway. (2016). Penalties for failure to report and false reporting of child abuse and neglect. Washington, DC: U.S. Department of Health and Human Services, Children’s Bureau. Giardino, A. P. (2016). Child Maltreatment: Emerging Issues in Practice, Care and Prevention. Hauppauge, New York: Nova Science Publishers, Inc.
Kerns, R. (2015) Crying wolf: The use of false accusationsof abuse to influence child custodianshipand a proposal to protect the innocent. 56 S. Tex. L. Rev. 603 2014-2015, 604-635. Neoh, J. &Mellor, D. (2009). Professional Issues Related to Allegations and Assessment of Child Sexual Abuse in the Context of Family Court Litigation, Psychiatry, Psychology and Law, 16 (2), 303–321. Owhe, J. (2013). Indicated reports of child abuse or maltreatment:When suspects become victims. Family Court Review, 51, (2), pp. 316-329. Trocme, N. & Bala, N. (2005). False allegations of abuse and neglect when parents separate, Child Abuse and Neglect, 29, 1333-1345. John Kesner is an Associate Professor in the Department of of Early Childhood and Elementary Education. His research interests include child maltreatment reporting, specifically mandated reporting and the cultural (home and at school) use of corporal punishment.